This is a very popular Italian soup traditionally made each fall once the new olive oil arrives in late October or early November. My version of this soup is made with seasonal vegetables including borlotti beans, zucca (pumpkin), carrots, celery, onions, cabbage and potatoes. Of course new extra virgin olive oil is the star in this soup as you’ll see in the instructions! If you read the list of ingredients in this soup you’ll quickly realize why this soup is healthy as the ingredients are all nutritious on their own, yet when assembled together, you create magic in the soup pot. Now that the weather is cool here in Umbria, a hearty vegetable soup is the perfect lunch dish, so I find I am making soup almost on a daily basis. We like to grill a slice of crusty, whole grain Italian bread, rub it with garlic and drizzle it with oil and place it in the bottom of our soup bowls and then spoon the soup on top of it. By the time you have eaten down to the bottom of the bowl the bread has deliciously softened with all the flavors found in the soup. I understand that most folks may not have access to newly pressed extra virgin olive oil as we do, so instead, simply buy a really good bottle of extra virgin oil to use in this soup. Most of the recipes I read for this soup used dried borlotti beans, and although I normally do not take shortcuts, I did not see a reason not to use canned here. I wanted my vegetables chunky for this soup so I cut them a little larger than I normally would for a soup. This flavor of this soup is even better the second day, but you may need to add extra liquid as it will thicken sitting in the refrigerator. This soup doesn’t need anything fancy to garnish it apart from a good drizzle of the extra virgin olive oil, or a little grated Parmesan cheese. To make this soup vegetarian, simply leave out the chopped pancetta. This soup, like many Italian soups is best served very warm but not steaming hot. Too hot and you lose the complexity of the flavors, just nicely warm, and the flavors sing! Give this soup a try drizzled with some really good quality extra virgin olive oil, and you too can celebrate olive harvest in Italy! Cabbage Cabbage is an excellent source of vitamin C and a good source of vitamin A, and an exceptional source of antioxidants. Extra virgin olive oil is a heart healthy mono-unsaturated fat that is rich in anti oxidants. 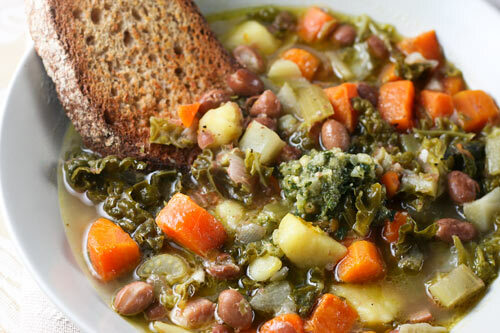 This soup is packed full of healthy veggies and drizzled with olive oil to celebrate Olive Harvest in Italy. In a heavy saucepan, heat the three tablespoons of olive oil, and then saute the onion, celery, pancetta, and carrots until the vegetables have softened and the pancetta is lightly browned. Add 4 cup of broth, the chopped cabbage, potatoes, pumpkin, and parsley and cook over low heat for about 45 minutes or until the potatoes are fork tender. Season with salt and pepper to taste. Take 1/3 of the beans and puree them stir this into the soup. Add the remaining whole beans to the soup pot, and continue to cook over low heat for an additional 15 minutes, adding the additional broth if soup is too thick. Spoon the soup on top of the bread, and the drizzle each bowl well with additional extra virgin olive oil.